El Centro, in front of her church, is the place to celebrate la Fiesta de Guadalupe. 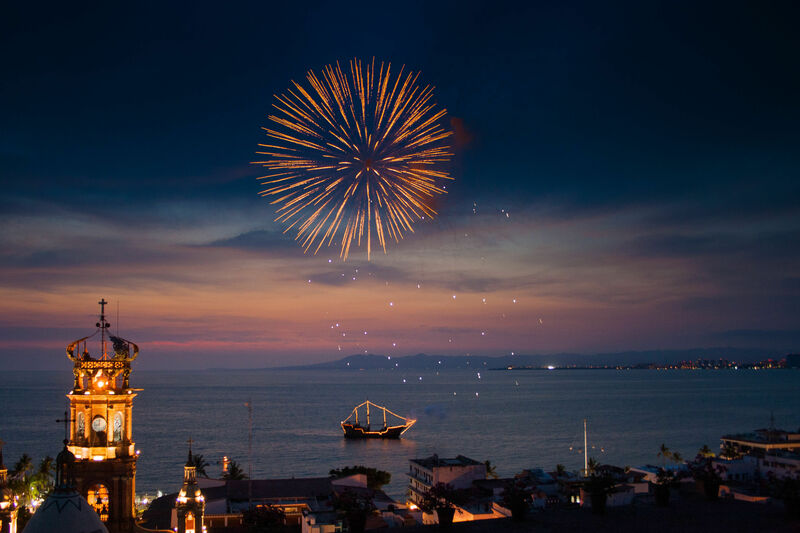 Many festivals are crowned by fireworks over the Bay of Banderas, Puerto Vallarta. Planning your Mexico visit during a local holiday or annual festival is a special way to enjoy the country’s cultural traditions and heritage, often at no cost. Celebrations focusing on religion, gastronomy, history and nature abound in every region and all year round. As Mexico’s self-proclaimed “Festival Capital,” the sophisticated beach town of Puerto Vallarta puts on so many events, especially from September through the New Year, that families have several options to enjoy them. And since it’s right in the heart of the sophisticated Riviera Nayarit region on Mexico’s Pacific coast, the weather and calm surf are ideal for relaxing after the festivities are done. Following are some of the Mexican national holidays, special events, and celebrations Puerto Vallarta will be hosting from August 2017 to June 2018. Horse lovers: this day, known in English as Cowboy Day, is when men and women ride through the town to honor Mexican cowboys. Count on local ranchers in sombreros, dress jackets or outfits showing off the city’s colors to ride their finest horses through the town streets. The festivities continue into the evening with stalls selling rich food, celebratory dances, and demonstrations of the traditional charro style of calf roping. On the Eve of Mexican Independence Day, thousands gather below the balcony of Municipal Square to listen to the Mayor proclaim el grito de independencia: “Mexicanos, Vive Mexico” at 11pm. El Grito is an event not to missed. Keep the kids awake for celebration in the streets, food, drink and fireworks. By the way, el dìa de independencia on September 16th commemorates the day that Miguel Hildalgo announced the Grito de Dolores, starting the Mexican revolt against Spanish rule. Businesses and government offices are closed and locals hold festivities with plenty of food and dance to celebrate their liberation. Since this part of Mexico is known for its many world-class restaurants, it’s no wonder they need four days to share a feast of flavors from seven Michelin star chefs who serve both Puerto Vallarta foodies and guests at the major resorts along the coast. The 9th edition of the Vallarta-Nayarit Gastronomica (schedule here) will also feature celebrity chefs from around the world exploring the roots of their cooking. Pre-Hispanic religion, life, death, and art come together in honor of deceased family members and friends. For the Mexico culture, costumed participants and parades of colorful skeleton dolls are as close to Halloween as you can get. In Puerto Vallarta, the cemetery located on 5th of December is the site of traditional Day of the Dead observances, but of course relatives honor their ancestors at their own family burial sites. The City sponsors an altar competition in the main square, and the Asociacion Vallarta Centro organizes themed art workshops – great fun to see the contestants’ work. According to Tourism director Javier Aranda Pedrero, the state of Jalisco will host the first world invitational mountain bike races over four days in November on a 240-mile route, from Ferreria de Tula to Union del Tula, Talpa de Allende and to Puerto Vallarta. After 14 successful years, the Puerto Vallarta International Half Marathon on November 5, 2017 is expecting nearly 2,000 runners from Mexico, the US, Canada and countries as far off as Kenya. Join the estimated of 15,000 spectators who will be there, and raise a margarita to cheer them on. Stick around from November 17-19, the Pacific Games to compete in a CrossFit event. Puerto Vallarta’s favorite food festival takes place over a 10-day period before Thanksgiving, and we know you’ll be grateful for the tasty samplings on display throughout this walkable seaside village. Expect teamwork among many guest chefs producing new recipes, and enjoy culinary safaris, meet n’ greets with chefs, and themed nights offering distinct dishes – not all spicy — from cities around the world. The 61st edition of this annual fishing tournament, hosted by Club de Pesca Puerto Vallarta (est. 1956), brings together fishers from around Mexico and the Pacific coast to test their reels in Banderas Bay, which has a surprising diversity of deep sea fishing options. Root for your favorite boat to win cash prizes for the biggest catch, then have some grilled parga for dinner. Join Puerto Vallarta locals to commemorate el Dia de la Revolucion, the start of the Mexican Revolution ignited by Francisco Madero. More commonly known by its date, there will be colorful parades and festive street parties, as well as patriotic speeches and official ceremonies. The Mexican Revolution against dictators lasted from 1910-1917, so this year marks 100 years since the end of the revolution. The feast day of Mexico’s patron saint, Guadalupe or the “Queen of Mexico,” is celebrated on the same day as Puerto Vallarta’s founding. On December 12, the Church of Guadalupe in Mexico City hosts a midnight ceremony featuring mariachis and other performing artists that will be live-streamed nationwide. Come see the festively decorated hotels while rates are still in low season, and hand-painted statues and enormous flower sculptures around town. The mass is capped off by a festival on the waterfront promenade with fireworks, more food and dancing the next day in front of the Basilica. Christmas (La Navidad) is widely celebrated in predominantly Catholic Mexico with nearly two weeks of festivities. Beginning December 15, see Las Posadas or nightly processions of colorfully dressed characters carrying icons and statues, which symbolize Mary and Joseph’s journey to Bethlehem. Spend Christmas Eve in El Centro outside Our Lady of Guadalupe where piñatas, live music and dancing continue into the night. Puerto Vallarta’s New Year celebration takes place on the Malecon, the best place to watch the fireworks display over Bahia de Banderas. Afterwards, take the whole family to the cobblestone streets of the Romantic Zone for music, dancing and fresh tacos. The locals celebrate midnight by eating the 12 ‘grapes of happiness’ — one grape every time the clock strikes – a vestige of the Spanish tradition. Carnaval, the festival many associate with Mardi Gras in New Orleans, is celebrated around the world and Mexico is no exception. A traditional period of celebration that begins on 12th Night in January, and culminates on Mardi Gras or Fat Tuesday (also called Shrove Tuesday), it’s always celebrated 47 days before Easter to mark the first day of Lent. To read more about the festivities (typically late February early March), please read 15 Favorite Mardi Gras Outside New Orleans. Puerto Vallarta hosts an annual two-day Taco Festival in mid April, giving visitors a delicious chance to sample the town’s best offerings and get to know Mexican cuisine. 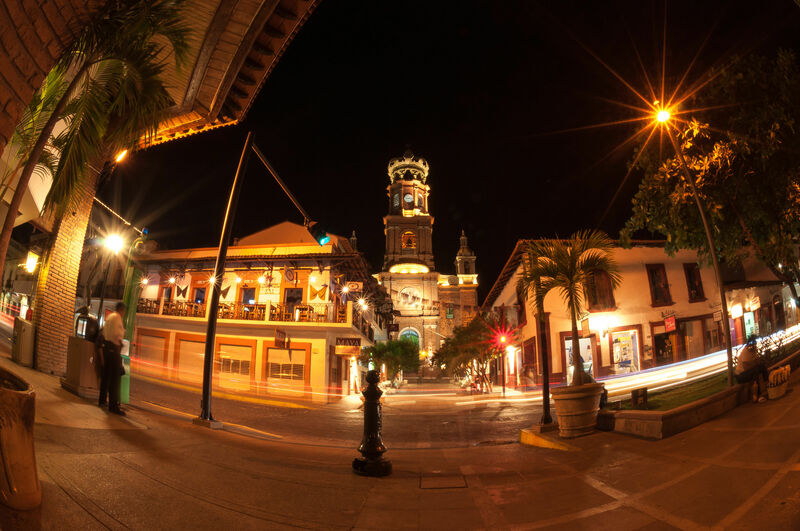 Puerto Vallarta will be turning 100 in 2018, and the celebrations began with the 2017 prelude, May Fest, a feast of its 99th anniversary as a municipality, and its 49th anniversary as a City. The Puerto Vallarta Tourism Board, Puerto Vallarta OCV and the City of Puerto Vallarta will mark the anniversary with events taking place throughout the month and city, including sports events such as the Vallarta Open Waters Cup swimming competition, and the Via Recreativa recreational run, cultural exhibitions and musical performances. Puerto Vallarta is a welcoming town to experience these cultural celebrations first hand. No need to speak Spanish either; the local community welcomes international visitors interested in their traditions. Through October 2017, you have a chance to win a family vacation to Puerto Vallarta from a tourism office promotion; their site provides information on accommodations, dining and other activities as well. This post is sponsored by Puerto Vallarta Tourism; the opinions and genuine enthusiasm for the city are those of the author.